Quantum & Woody have always had a tense relationship, but that’s makes them so fun. Two estranged brothers forced to interact with each other because of their superpowers, Eric and Woody Henderson are polar opposites that constantly infuriate each other, and they’re back at each other’s throats in the new Quantum & Woody ongoing by writer Daniel Kibblesmith and artist Kano. A writer for The Late Show With Stephen Colbert (and a former writer for The A.V. Club’s sister site Clickhole), Kibblesmith has a sharp sense of humor that makes him an excellent fit for this series, and he’s shown a passion for Valiant Comics with the ComiXology-exclusive Valiant High, an alternate universe miniseries that put these characters in a high school setting. 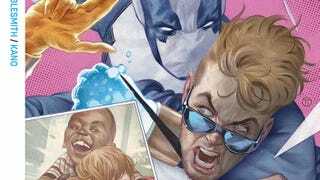 The smartest thing about the current Valiant’s reimagining of ’90s Quantum & Woody is that the heroes are brothers rather than estranged childhood friends, and that deeper familial relationship fuels much of their antagonism toward each other. Family ties are especially important for this new run, which introduces Woody’s birth father to introduce even more drama. This exclusive preview of Quantum & Woody #2 (on sale January 31) reveals how this revelation drives an immediate wedge between the two heroes, setting off a fight that leads to them blowing up the inside of their family home in one big metaphorical moment. In the most cleverly designed page, the heroes’ pet goat (who is actually their father) scales the side of their house to listen in, and it’s a prime example of how Kano experiments with page design and graphic elements to put a new spin on superhero artwork. We’ve also included the previously released excerpt from Quantum & Woody #1 (on sale December 20), and these pages spotlight the imagination and innovation of Kano’s layouts while showing how Kibblesmith is reinforcing Eric and Woody’s brotherly bond. The prologue showing the two as boys says a lot about their personalities and informs their current relationship, and it also sets a serene, idyllic mood that is shattered with a burst of energy by the fight scene that follows. One of the main visual principles of this series is putting smaller panels on top of larger images, giving readers the big picture before zooming in on specific details. Kano is the best artist at Valiant Comics (and they have some great artists), and pairing him with Kibblesmith’s distinct voice makes Quantum & Woody a superhero series not to be missed.